A death certificate Irish America contributor Dermot McEvoy used in his recent genealogical search. Courtesy of Dermot McEvoy. Irish Family History Day is Thursday, January 24. In partnership with The Gathering and the launch of more than 21 million birth, marriage, and death (BDM) certificates to the site, FindMyPast.com has declared Thursday, January 24 to be “Irish Family History Day.” It’s more than just a nominal accolade though, because this Thursday the site is opening their Ireland records to the public free of charge. FindMyPast.com is normally a paid subscription-based online genealogy service, but for 24 hours you’ll be able to browse their newly expanded online Ireland archives to your heart’s (and wallet’s) delight. The new records consist of two parts, the Civil Registration Indexes and supplementary material culled from published obituaries, newspaper announcements, indexes to wills and gravestone details. 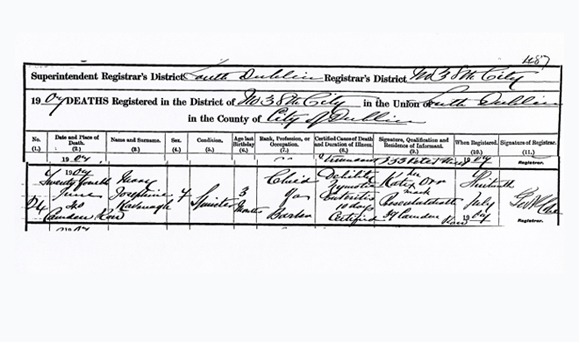 The Civil Registration Index only began in 1845, and it was not until 1868 that every birth, death, and marriage was required by law to be recorded, so the combination of the two sources by FindMyPast means a more complete genealogy database. As is plain from Dermot McEvoy’s article on researching his mother in this issue of Irish America, doing genealogy research can get expensive fast, especially when you’re beginning and may have a broader scope to your research. Irish Family History Day is a good opportunity to get a head start for free before heading, say, to the Guinness Brewery or the General Register Office Research Room. In order to access the archives for free on FindMyPast, you will need a promo code which will be posted on the FindMyPast US blog here. The FindMyPast.com promo code will work on all international affiliate sites, including findmypast.com.au, findmypast.co.uk, and, of course, findmypast.ie. of your site to let us take a peek into our past.